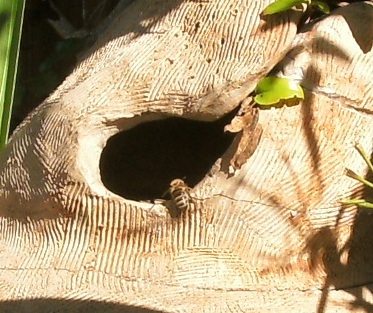 Honeybee entering the clay lion hive. I'm staying with my sister Penny and her husband Jim at their home in California, and along with the beauty of the flower gardens, the bounty of the orchard and vegetable and berry gardens, the fantastic views of the mountains and ocean, I am entranced by two groups of wild honeybees* in happenstance hives. The owl house hive is in a large Monterrey Pine just beyond the old chicken coop, and the clay lion hive is at the top of the drive, just outside the door to the pottery studio. Both hives have sprung up on their own over the past couple of years. Penny and Jim didn't do anything in particular to attract the bees, but no doubt an acre or two of avocado, orange, lemon, lime, grapefruit, plum, peach, apple, blood orange, tangelo, cherimoya, pomegranate, and persimmon trees, numerous flowers, a vegetable garden, and assorted berry patches appeal mightily to the honeybee. It is a pastoral setting loaded with nectar and pollen. 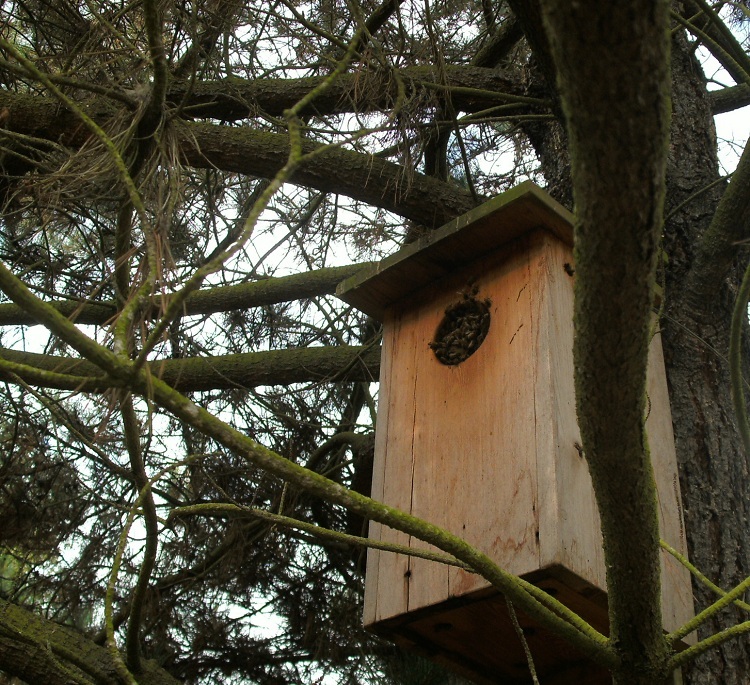 Honeybees took up residence in the owl house in early spring 2011, about two years after the house was nailed about 12 feet up in the tree. Jim and Penny had been hoping to attract barn owls to help with a glut of gophers, and the house was designed and built by a good friend and neighbor and given to P & J (as we will henceforth call them) as a birthday present (Penny's is April 13, Jim's April 15). The house measures about 15 inches high by about 6 or 8 inches wide and deep, and the entry hole has a diameter of about 2 inches. The top is hinged. Before hanging, Jim lined the bottom with dry leaves. Alas, no owls came to enjoy. When the bees moved in P & J deliberated a bit about what to do and decided to let them be. The bees have thrived. They have covered the entry hole with what may be honeycomb, though from the outside it is smooth, and they fly in and out in droves through a little gap left at the bottom. P & J said that recently they've seen bees bearding on the hive, hanging and dripping off the front like honey. Many people, including me, have expressed interest in opening the top of the owl house to see what's going on inside, but no one, including me, has yet done so. The tree the bees live in was P & J's first Christmas tree at this house, given to them by Jim's father in a 5-gallon bucket. 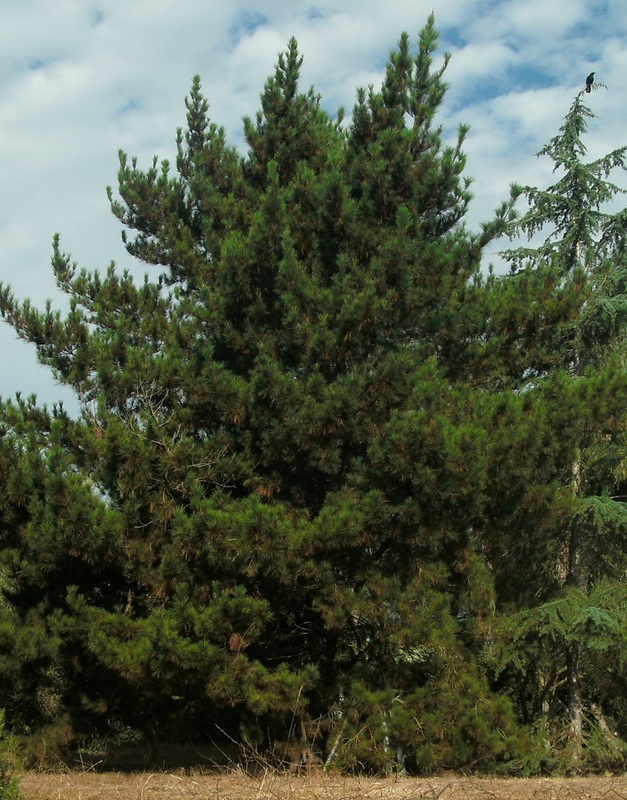 After the holidays, Jim planted the tree and ever since has tended to it just once a year at Christmastime when he lops off and wires together a few branches to make a holiday tree. The Christmas tree that harbors the owl house hive. Honeybees set up shop in the clay lion early spring 2012. Jim made the lion in 1972 when he was a student at the Santa Barbara Art Institute. The lion is kind of like a big, hollow, red clay ball with a slightly comical lion's head on top - the lion is sitting on his haunches, head back, nose to the sky. Overall it is about two feet around and 3 feet tall. The lion sports a snarly grin, and the bees come and go through a hole that is one corner of the lion's mouth. For many years the lion resided at Jim's parents' house. When it moved to P & J's it first hung out by a plum tree, but for the past 15 years or so has been in a small garden at the top of the drive, being quite quiet and beeless. Then the lion began buzzing and so many bees were coming and going that P & J thought they might have to move it away from the house. The bees' flight path collides with the people path that goes from the house to anywhere, and Jim said he and Penny eventually got used to the bees ricocheting off them as their paths crossed. 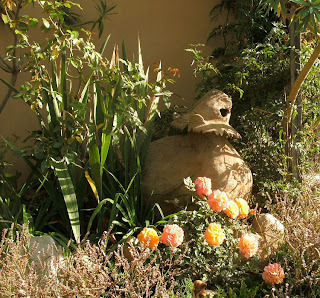 Early this summer activity in the clay lion slowed down; perhaps the bees swarmed when P & J were away for a few days. According to Jim the lion has an open bottom. If tipped over, one should be able to see what is happening inside. But tipping has yet to happen, and for today, anyway, the wild bees come and go in peace. * Or escaped domesticate bees, if you prefer.